Over the next few months we will continue to provide high quality, tailored training events for creative businesses, focusing on the areas where you have told us you need the most support. Places tend to book up fast so make sure you don’t miss out! Visit our Eventbrite page now to check out details of our forthcoming workshops and secure your place. We have a few places remaining on our popular Press & PR workshop in Swadlincote on the 13th February. The workshop helps creative businesses increase their exposure in local and national publications and media. Places are also available on an additional Pricing Strategy for the Creative Sector workshop taking place on the 17th April in Ilkeston. We will also shortly be announcing dates for workshops to help artists and creative businesses make the most out of attending arts and crafts fairs. Please remember that our workshops and training events are extremely popular and tend to sell out quickly, so we advise early booking to avoid disappointment. We try to offer workshops in a range of locations across Derbyshire to ensure that everyone has the chance to attend. If there are topics which you would like to see in our development programme, please tell us. We need feedback on how the programme is doing and welcome your comments. For more information about our workshops visit our Eventbrite page. 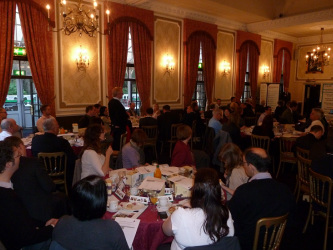 A packed Ringwood Hall in Chesterfield saw over 100 local businesses attend the Creativity, Innovation and Business Growth breakfast briefing on the 31st January. The event, which we jointly hosted with Destination Chesterfield, included key presentations demonstrating how creativity can be a major driver for economic growth in the County. Presentations included Derbyshire creative businesses Wild in Art and the Derbyshire Times Creative Innovation Award winner, Audio Trails. Other presentations included Chesterfield College and the Derbyshire Education Business Partnership. Over the last quarter of 2012 we undertook some thorough research into the health of the creative sector across the County. In total over 80 creative businesses responded to our survey. The key findings are highlighted below. Despite a challenging trading environment, the creative sector still seems to be expanding across the County, looking to create new employment opportunities as well as work placements and opportunities for apprentices and work placements. Thank you to all the businesses that completed the survey. We hope you will continue to contribute to our research in the future. Following a successful Creative Careers Fair at Chesterfield College in June last year, we are working with the college again to deliver another careers-focused event during National Careers Week on Monday 4 March. The Creative Careers Fair 2013 will comprise of a fair with exhibitors from the creative sector, careers advice and guidance, exhibitions, workshops and presentations from artists and creative businesses. The free event will give young people aged 16-24 the chance to learn all about potential career pathways and destination routes into a creative career. If you would like to get involved or are interested in having a stall at the event, please email Jane Brown at info@creativederbyshire.com. Creative Derbyshire provides Marketing Grants to new and emerging artists to help boost the county’s creative economy and both support and promote Derbyshire’s local artistic talent. The deadline for the next round of Artists’ Marketing Grants is Friday 1st March. For further details click here. Did you know that we advertise all the latest local and regional creative jobs and opportunities on our website? We also list relevant business events. We update the site daily, so it’s worth checking on a regular basis. Click here to visit our Jobs and Opportunities page or click here for our business events page. You can also submit jobs, opportunities and events via the form on the pages. Creative Derbyshire is a programme of support and development for artists, arts organisations and creative businesses across Derbyshire. Our focus is on developing the creative economy and fostering a culture of innovation and excellence. Creative Derbyshire was established in 2010 in response to research undertaken by Derbyshire County Council into the needs of the arts and creative industries sector in Derbyshire. We're always happy to hear your feedback; or you can come and talk to us on Twitter and Facebook.